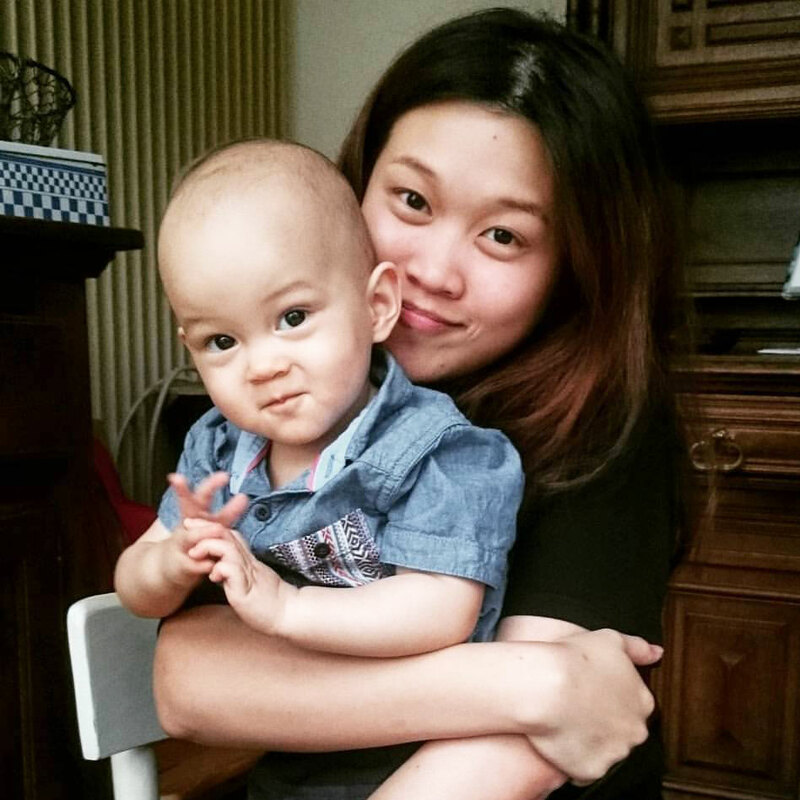 Phew, finally I found some time to blog about this trip. Read the 1st day here. 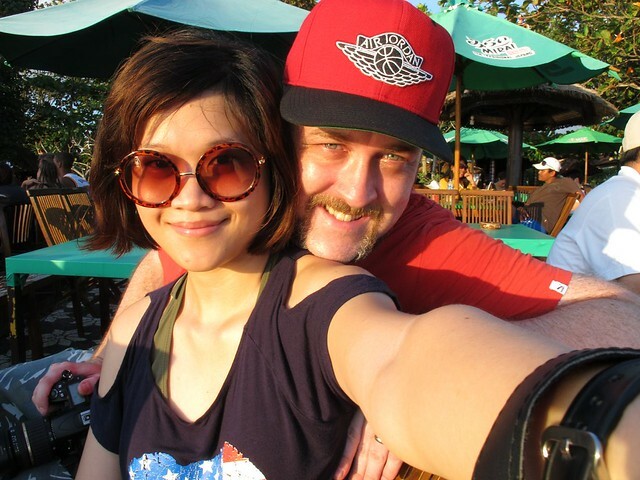 On our 2nd day in Bali, we decided to check out Kuta Beach. After taking two pictures of the beach, we left. Even then I felt like we had stayed far too long. Firstly, it was hellishly hot! I felt like I was going to melt. My feet were burning, it was like walking on burning glass. Secondly, there were so many touts! I don’t like touts, leave me alone! 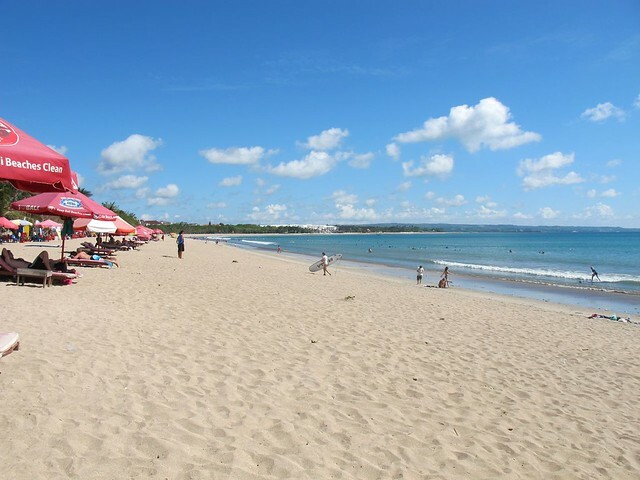 # – Kuta Beach picture 1. 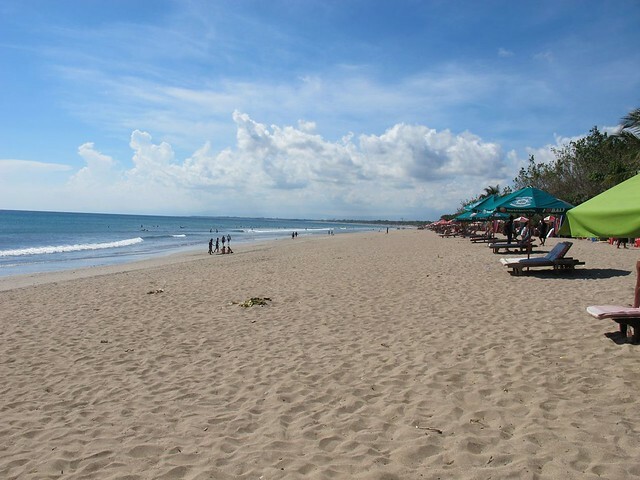 # – Kuta Beach picture 2. 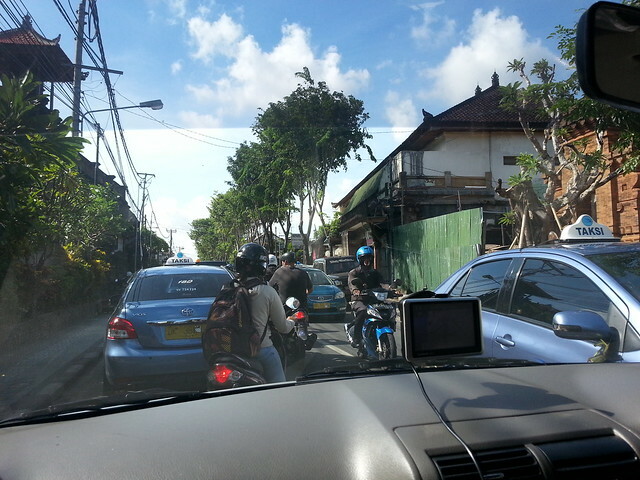 After spending less than 5 minutes there, we left Kuta Beach in our rental van to go to Tanah Lot. As usual, we were stuck in a traffic jam. Almost an hour before we managed to leave Kuta alone! # – Traffic jam. Yawns. 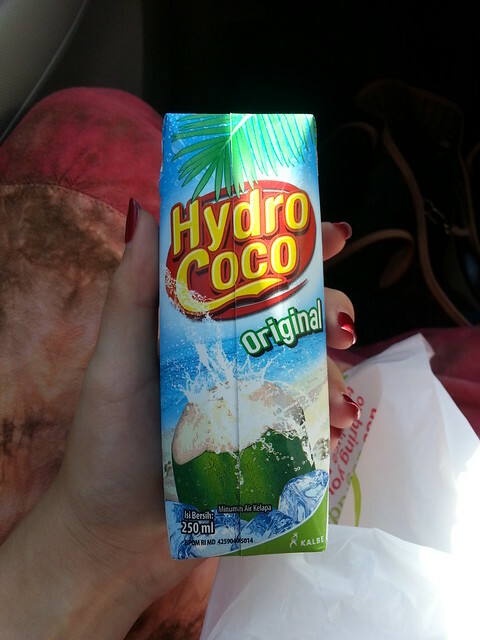 While stuck in the jam, I tried this coconut juice in a packet. I was a bit skeptical cause packeted coconut juice sold in Malaysia are nasty. This one was very nice though. 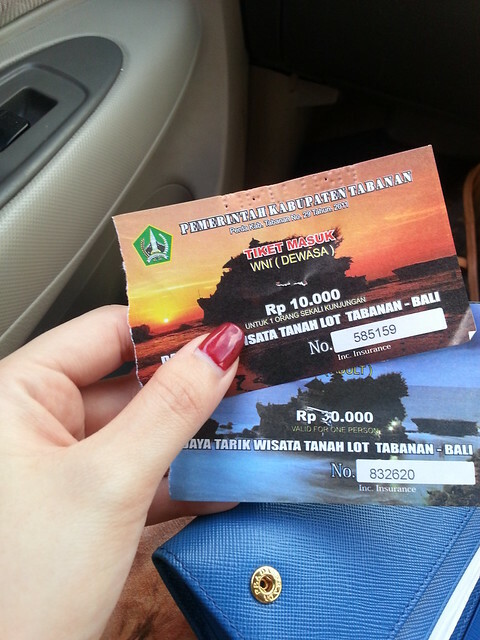 # – My ticket only 10,000 rupiah, whereas G’s was 30,000 rupiah. Score! 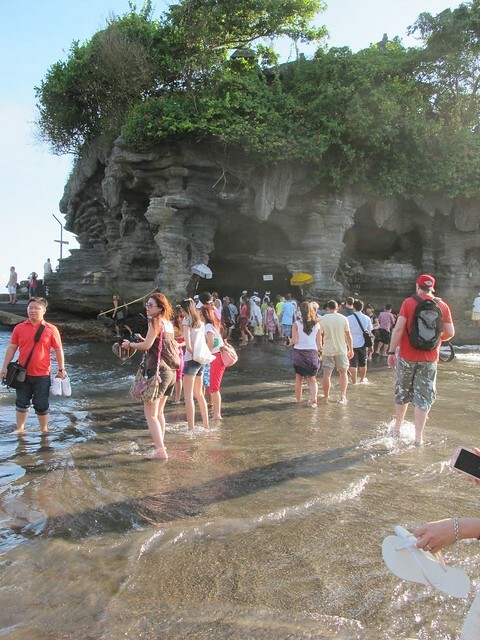 There were so many people at Tanah Lot! 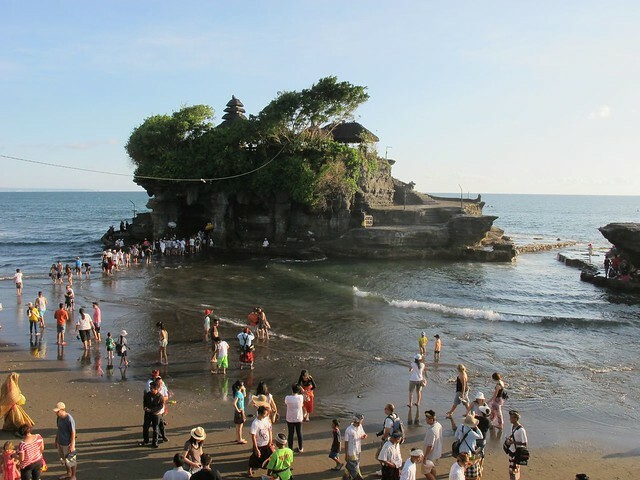 I thought to myself, Tanah Lot would be such an amazing place if it was quieter. Too bad it’s never going to be that way. 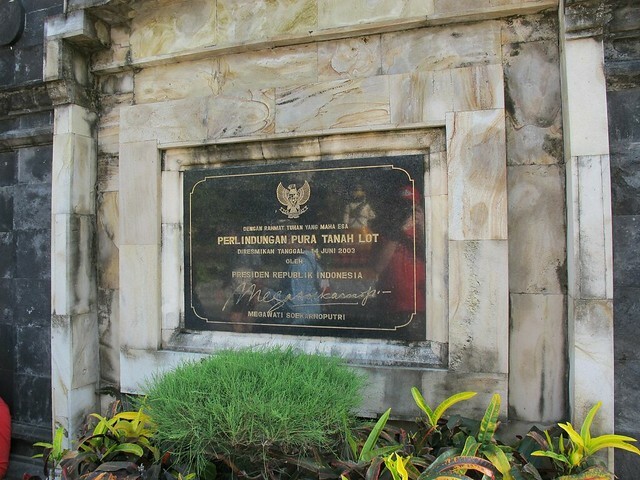 # – Tanah Lot entrance. We joined the trail of people queuing up to be blessed with holy water. 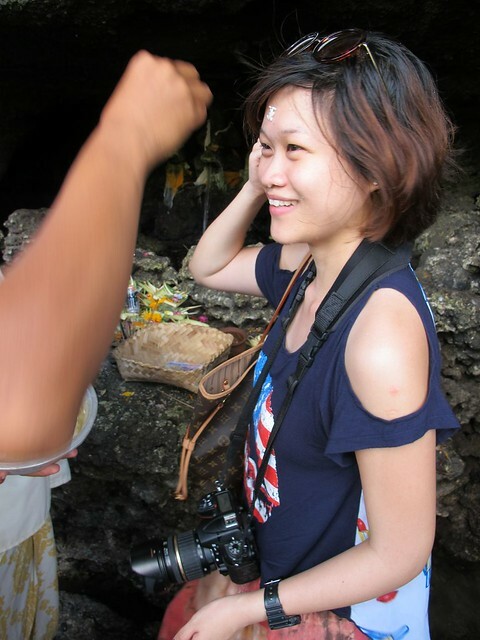 I think we donated like 5000 rupiah each for some rice to be stuck to our foreheads and frangipanis behind our ears. We also got to wash our hands and face with the holy water. Then we went up the side of the temple, but we were not allowed to go all the way up. 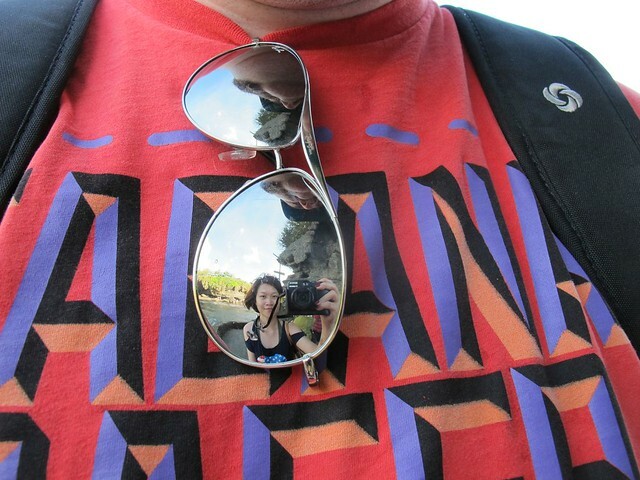 So we hung around the stone staircase for a bit and camwhored. # – Trying to be artistic. After mucking around for a bit, we decided we had enough so we started exploring the nearby shops. # – Saw phallic carvings. 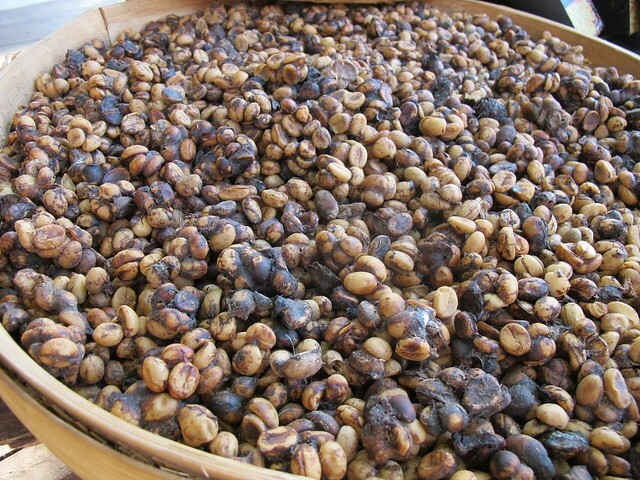 # – Saw coffee beans pooped out by civet cats. 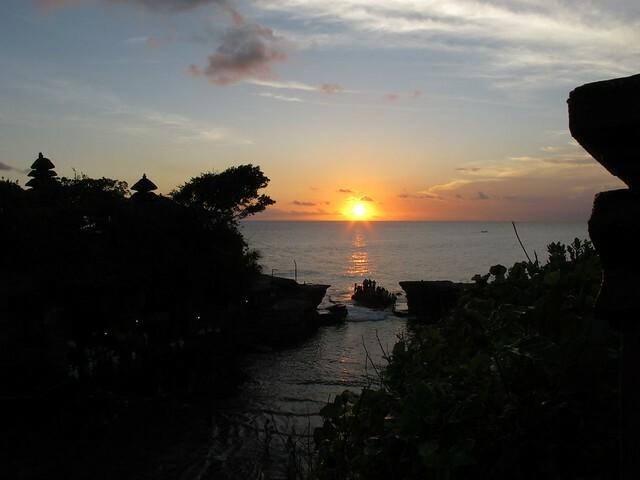 Then we went to sit down at one of the restaurants overlooking Tanah Lot. We decided to wait for the sunset. By now, I must had taken over 200 shots of Tanah Lot from various angles permissible by how much I could twist and turn my arms. But I ain’t posting any of them. 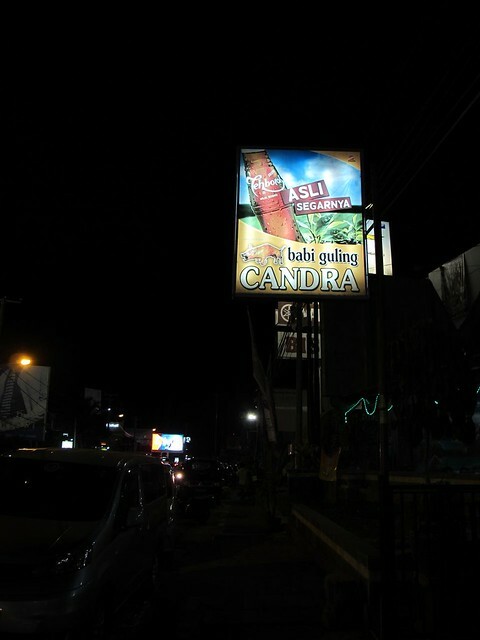 On the way back, we stopped by a pretty famous Babi Guling restaurant called “Babi Guling Chandra” in Denpasar, found by my white husband. During this trip, we went to two babi guling places and while both were good I prefer Chandra more. # – Babi Guling Chandra. # – Babi guling special. Delicious! 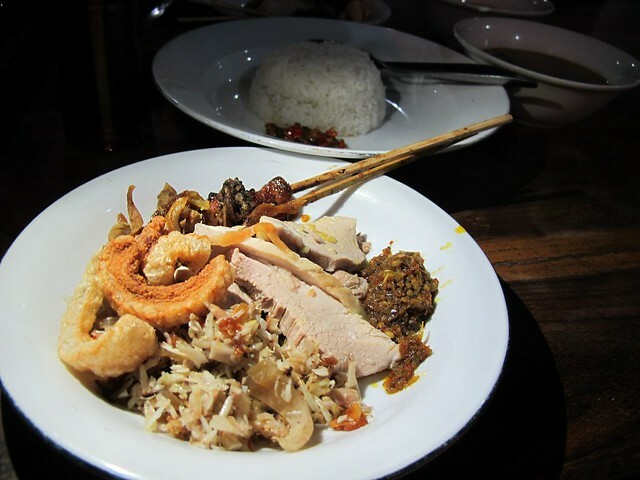 The meat was really moist, the urap (some kinda salad) was juicy, crunchy and flavourful, the sambal packed a punch, the satay was meaty & juicy, the crackling O M G!! They ran out of the crispy skin but I didn’t miss it. 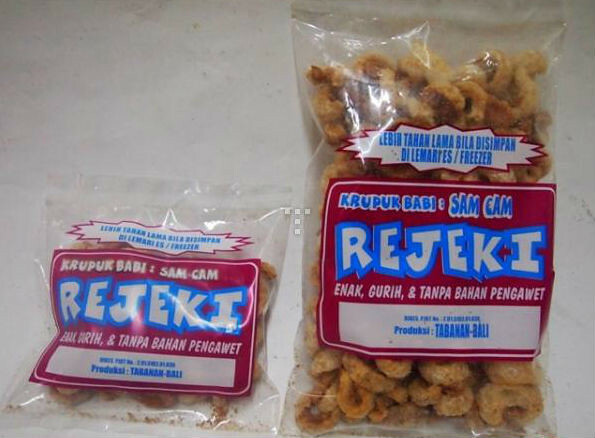 And then, I absent-mindedly bought two bags of cracklings called “Krupuk Babi Rejeki”. I wish had bought more cause ladies & gentlemen those are the best gawddamn cracklings I have ever tasted in my life. It was crunchy but not jaw breakingly so. It was so well-seasoned, once you popped you can’t stop. It cost 40,000 rupiah a bag and it’s so worth it. Amazing stuff. Apparently you can only get them in Babi Guling Chandra, so don’t miss it.